What does a good office look like? When cities are thinking about intervening in their city centre office market, the temptation will be to simply build more office space. This will be the right call in some cities, but others may already have a plentiful supply of offices. In these places, the quality of the existing city centre office space will be more important, as well as the extent to which it supports the growing trends for co-working and flexible space. But before deciding how and when to intervene, cities need to first figure out the specific gaps in their local office market where private developers aren’t responding to existing demand. 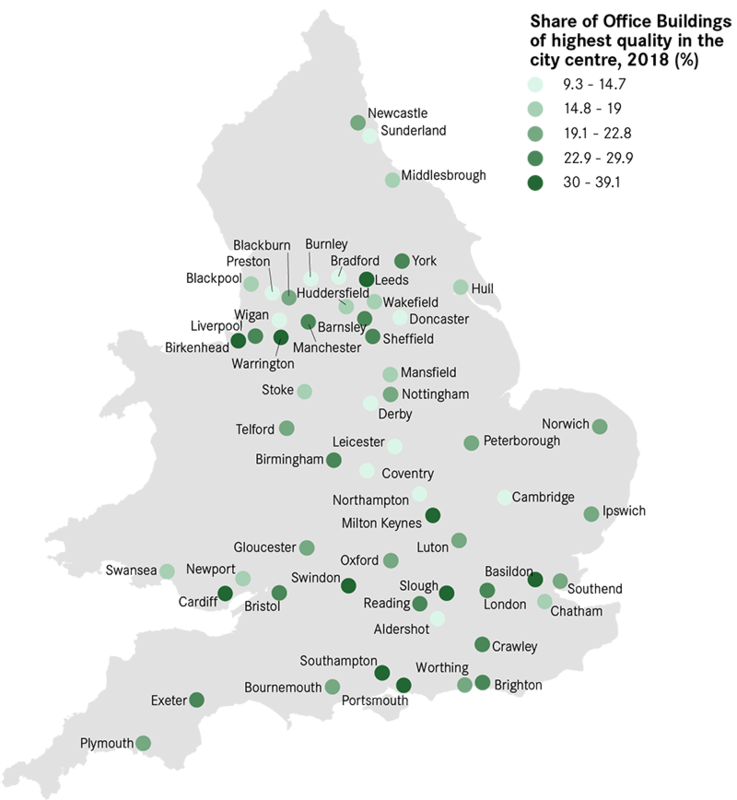 There’s no single national office market, and the quality of offices on offer varies a lot across the country. The map below – using data from our recent report Building Blocks: the role of commercial space in Local Industrial Strategies shows that while 39 per cent of offices in Southampton city centre is of a high quality, this drops to only 9 per cent in Coventry and Leicester. But while this data shows the quality of office buildings, it doesn’t tell us much about what occupiers want from offices. 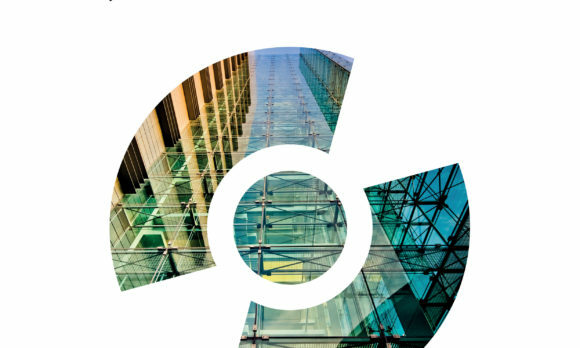 The value of offices is determined by the location, condition, and the amenities they are able to offer to occupiers, and understanding the services occupiers are demanding is key for any office market. One growing trend in office space is the rise of co-working. Collaborative spaces such as WeWork have recently expanded in London and Manchester and in other large cities around the world. These have two main advantages for businesses – knowledge spillovers and more efficient use of commercial space. Freelancers can rent desks in these offices, devour free snacks and coffee, and meet and do business with other enterprises who have sat down right across from them. Start-ups and larger firms also use the flexibility to easily acquire (or reduce) desks as their needs change, squeezing as much value as possible out of city centre locations by not paying for excess commercial space. But it’s not just the big cities which are seeing office space change. In our research for the Building Blocks report, we were struck by how many other cities across England and Wales are already responding to occupier demand by providing features such as co-working or ‘easy in, easy out’ flexible leases. Warrington, Bradford, and Bristol are all embarking on co-working spaces of their own. 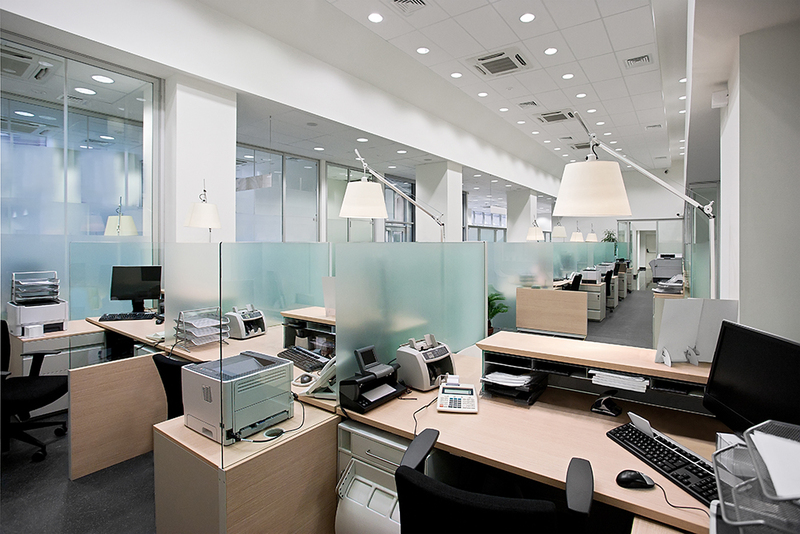 Demand for these innovations in office space is therefore widespread across the country. For instance, the non-profit IndyCube provides co-working office space in London, but also in cities like Wakefield, Cardiff, Swansea, Newport and over a dozen towns in Wales. Even in urban areas with very small economies such as Rhyl and Abertillery, it is possible to rent a desk, just as you can in the most up-to-date offices in large cities. Each city should identify any weaknesses in their office market, and justify whether they should respond to them through their Local Industrial Strategy. In some places, this might be providing more high-quality buildings, and in others, it might just be more co-working and innovative space. Crawley, for example, has a city centre which lacks large offices of 5,000 square metres or more, while the average city has roughly a quarter of its office space in buildings in such large offices. Based on the evidence Centre for Cities laid out in our report on the Economy of the Gatwick Diamond, this suggests Crawley could perhaps justify intervening to supply more office space. Other cities, in contrast, may have plenty of large offices, such as Preston, but have a shortage of high-quality buildings or innovations like co-working. When it comes to interventions, cities should only act when it’s clear there is a market failure and the private sector is not responding to existing demand. Huddersfield and Derby have both supplied small amounts of new office space with features such as co-working, one step at a time so as not to swamp local demand, in response to a shortage of office space in the city centre and a lack of new private sector supply. This is not to say that “build and the jobs will come” justifications for risky speculative office schemes will work – they won’t, as cities should be intervening in commercial property to respond to demand rather than trying to create new demand. Improving skills and transport provision will be more important than shiny new skyscrapers in most cities. But in cities where there is an existing kernel of high-skilled work, making sure this activity has the office space it needs in the city centre is an important step for improving local productivity. As work changes, cities should recognise that their commercial space will need to evolve too. A timely note. Work is changing and how people work is changing. Building more large floor plate mega blocks is not necessarily going to attract hi-growth businesses. There is a place for “quirky” meantime space that can attract start ups to an area and create a buzz that justifies investment, recognising that as an area improves it will lose its edginess to draw in the micro-enterprises who will look for a new cheap place leaving behind the growing, stable (relatively) businesses creating jobs and local wealth.